I made our reservation for newly opened Hot Stove Restaurant without realising that it was the Saturday before St. Patrick's Day. When I copped the possible impact of being in Dublin city centre on the weekend of the national day of debauchery, I nearly cancelled. But when you can take a bus direct from your house straight to Parnell Square West, then running the gauntlet of paddywhackery doesn't seem so bad. Long-established Michelin-starred restaurant Chapter One is just around the proverbial corner, and just like its older neighbour, Hot Stove is another finely designed basement restaurant. A bar area with seating is to the left upon entering, while two dining rooms open up to the right. The eponymous stove sits centred in the far wall of first dining room, while the wonderful tiled floor and orate radiators emphasise the period origins of the building. These features are somewhat at odds with the crisp white linen and ultra-sleek comfortable leather chairs. But I'm always a sucker for old buildings and I like the mixture. We were seated by co-owner Simon Keegan in the second dining room at the sole table with a view onto the rear walled garden area. In fact we were the sole diners in the room for a while, which meant that we received quite some amount of attention from the very attentive waiters. As we were dining early, we had a choice of the Early Bird menu but the well-priced a la carte menu won out. I was charmed by the idea of home-churned butter made with Wexford farm cream, sourced close to the home of chef Joy Beattie, but unfortunately it didn't have enough salty buttery goodness for me. An amuse bouche of bacon-y soup wass cleverly served in a glass espresso cup and set a good tone. 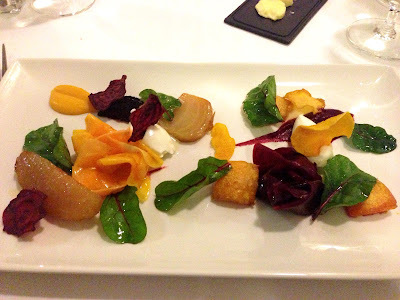 My starter of beetroot and butternut tasting plate with honey marscapone (€7) and sorrel was a sublime experience, showcasing the skills of a very deft chef. It was a symmetrical balance of light pickles, purees and roasted pieces, all married together by the divine little blobs of cheese. 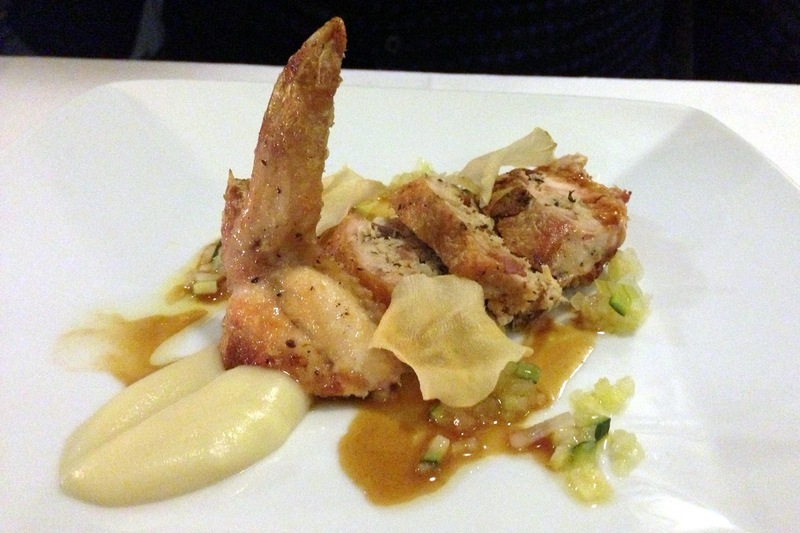 His stuffed chicken wing with artichoke dressing and courgette dressing (€8) was yet another example of how a humble ingredient can be elevated to something special. My main course featured pork two ways, a beautifully cooked fillet, alongside a small square of pressed belly and a shard of perfect pork crackling (€17). 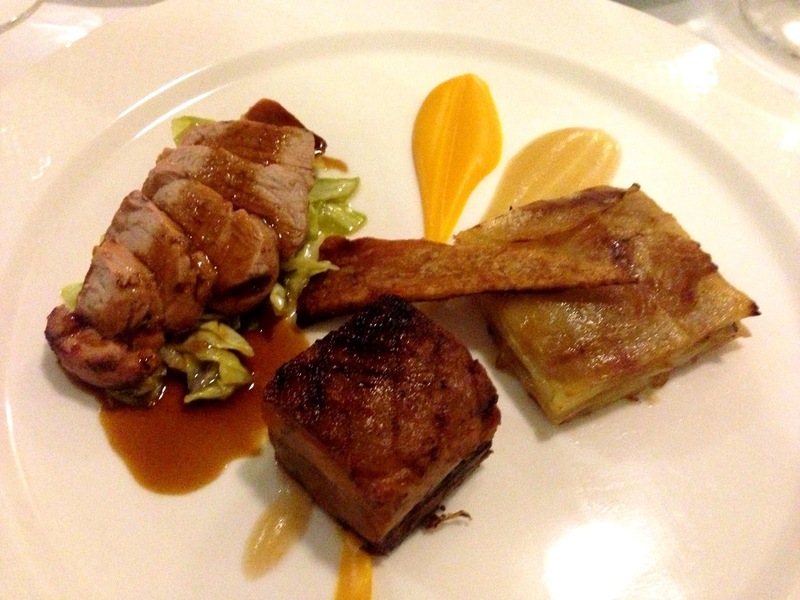 Fresh piquant choucroute and Boulangere potatoes provided contrasting textures and flavours in a hearty, warming plate. We had scuffled somewhat over who would order the ray wing, with Himself winning out. 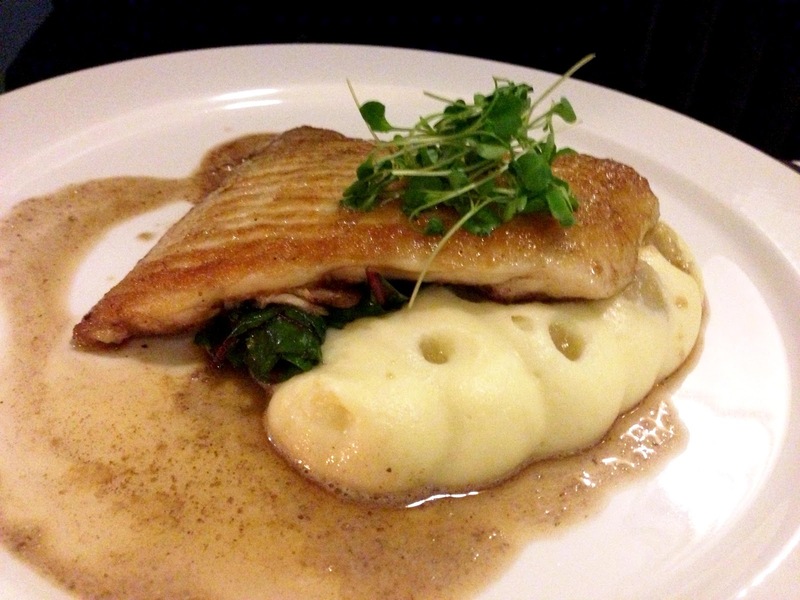 It came served on red chard, along with a lime mash and brown butter (€16). This magnificently meaty fish fell easily into shreds, with bite coming from the stripes of tangy sweet lime sauce. There was a definite upsell on the sides, but when duck fat chips (€5) and oh-so-buttery crushed Jerusalem artichokes (€3.50) are this good, it's hard to refuse. I could nearly have sworn that the chips came from a proper Cork chipper. (Sorry Dubliners, Cork has the best chips). 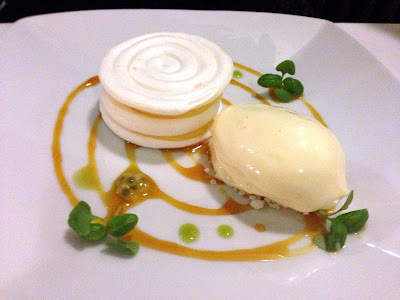 Desserts were good, with a tangy lime mousse for me (€7) and a rather delicious passionfruit layered pavlova (€7) for him. Both were accompanied by scoops of Wexford ice-cream, another sign where the loyalty of chef Beattie lies. 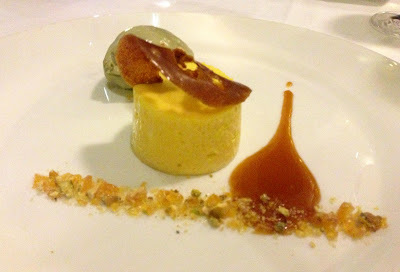 Throughout dinner, we drank a Pazo de Barrantes albariño (€32), with an indulgent glass of muscat Baumés de Venise (€7) accompanying dessert. Our waiters were extremely attentive throughout the meal, checking in on us with annoying frequency. We saw a lot of different faces, but to give credit, they were all unfailingly pleasant and helpful. Perhaps they just need to relax a little and lose the new restaurant jitters. The most wonderful thing about Hot Stove is that the final bill only just cleared €100. Food of this dexterity and skill can, and does, command higher prices in Dublin. It's a pleasure to eat the food of Chef Joy Beattie, who must surely be one of the foremost female chefs in Ireland. As Himself pointed out, we could have paid a lot more for a similar meal just around the aforementioned corner. As we leave, I can only offer the highest compliment that I possess, "We will be back". This restaurant has been on my "to try" list for a while - it has skipped to the top of the queue now!! I cant wait to try here! It also has been on my list for a while! I went to the Greehouse last weekend and it was amazing! So many nice places to try and not enough time hehe! !